Your kids can super-size their skyscrapers with these big City Building Blocks from Pottery Barn Kids. You’ll get six blocks in each set including pentagon, square and rectangular shaped buildings, all which are made out of sturdy recycled corrugated cardboard. Don’t want to buy the blocks? Go DIY. Get creative and transform old tissue boxes and other boxes you have around the house into similar blocks. 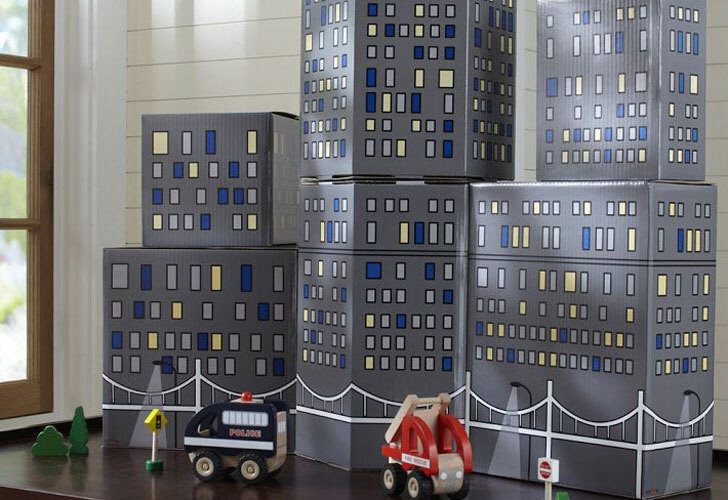 Your kids can super-size their skyscrapers with these big City Building Blocks from Pottery Barn Kids. You'll get six blocks in each set including pentagon, square and rectangular shaped buildings, all which are made out of sturdy recycled corrugated cardboard.�Don't want to buy the blocks? Go DIY. Get creative and transform old tissue boxes and other boxes you have around the house into similar blocks.